Little fingers that open and close around rattles and toys, amaze me. A small body twisting at the trunk to look around, puts me in awe. Head control. Rapidly kicking feet. A body that sleeps so easily and sound. My little Gunnar has given me these experiences as a Momma. New experiences. Milestones that come so easily without trial and practice and fight. That small brain just clicks and processes it all. I've taken the classes. I've read the books. I've even taught a few classes myself to parents about typical development. But NOTHING is as miraculous as watching your own child reach those goals. I feel such JOY! And NOTHING hurts more that watching your child struggle to meet those goals. I feel such PAIN! Everyday is a new lesson in joy. Everyday is a new lesson in grief. As I type little Gunnar jumps beside me in his Jump-a-roo. Reaching and mouthing the toys attached. He has just awoke from a blissful 2 1/2 hour nap. As I type, my Roa, is laying on the couch. Tired from his two therapy sessions today- one morning OT /one afternoon Speech. He is not able to nap today. I missed that window of opportunity. The parental guilt sets in as he watches a video because it is the only thing he can do on his own. The mommy guilt also because I pray that he drifts to sleep for a while so that I don't have to position him and entertain him more today before Daddy gets home. Depressing but reality. Our reality here. With some small fingers that grasp and play and others who long desperately to do so. Roa got his new AFOs and SMOs at Shriners last Friday. Another long appointment, 2 hours! UGH! Shriners is such a great place with such nice, helpful staff. However, I don't believe we will be going back there. We have been so happy with Gillette and Winkley Orthotics. Also, Shriners is going to start taking insurance, so there is no real benefit to going there for us. While being fit for his new orthotics, we noticed that the floor of the brace went quite a bit past Roa's toes. I asked them if we could cut it back, as Roa is used to "free toes". I also was concerned that we would have to buy shoes 2 times the size to fit this brace and that would hinder Roa's walking. They explained to us the reason why the brace goes out so far (due to toes clenching and increased tone) however, I don't want to take away his walking. I think the staff was really quite surprised that Roa does as much walking as he does. He can still get in his gait trainer or stander, they said. We kept repeating, "He walks EVERYDAY in his gait trainer."... on nice days, he WALKS the entire length of our street. It is not their fault they don't know that if they make his braces uncomfortable for movement and take away our walking, life at the Thayers would be pretty unbearable! Roa's WBL therapists have spring break this week, as does Andrea at Courage. It is a lighter work load this week with speech at Functional Kids and Conductive Ed. Back to the assisted seating/wheelchair idea... We know the time is coming that Roa will need a wheelchair or push chair. He is growing like a weed and is getting hard to carry. But for now, we hope to rely on his current stroller and the gait trainer. 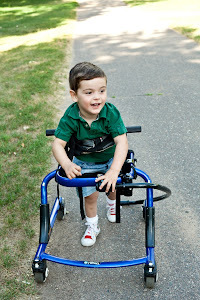 School in the fall will bring us in to the world of assisted seating for mobility. Until then, off we walk, gaining strength as we go... God willing. Blog time....oh how I miss you! I am sorry for my long absence from an update. These two Thayer boys of mine keep me pretty busy! Computer time is limited and when I have down time, between housework and bedtime,... my blog has taken a major back seat! So much has been happening in King Roa's life! As we speak, as I blog, Gunnar is sleeping in his swing and Roa is playing with a new app on his ipad in his blanket fort. Oh, the ipad....how we LOVE you!! I can't even begin to tell you how life changing it has been. Apple had NO IDEA that we special needs families would grow to truly rely on it. Roa has such freedom with his ipad. Freedom to operate things with his hands that don't always cooperate through traditional play. I joke with Bryan that we need to make sure we add 3-dimensional play into Roa's life each day! Don't worry, he gets plenty of that too. But with the ipad in tow, I can tend to Gunnar, make dinner, go to the bathroom,.. and Roa stays busy and entertained. AND he is learning, SO much! By simply touching the dog and it barks in Peek-a-boo Barn, Roa imitates the sound. By hitting the ipad fast or slow with his little fist with Cosmic Top, Roa learns about speed and how moving his body in different ways can make the top spin. Yes, we love the ipad in all it's glory. Roa visited Shriner's Hospital in Minneapolis last Monday. It was a L O N G day, but a great experience. Roa was seen by everyone under the sun. OT, PT, nurse, doctor, physicians assistant, orthasist. We were there for 4 1/2 hours!! But, we got a new stander, a new bathseat, and two pairs of braces are on the way. Shriners is a wonderful organization that helps kids with physical disabilities with very limited cost to the parents, if any! Everyone was so nice there and the Thayer boys were a hit! Gunnar was scooped up by nurse Kathy, and trucked off for show and tell in the nurses station. He giggled and impressed everyone. Roa was his usual entertaining self, laughing and playing keep away from Daddy. Both boys were rockstars during the long process. The therapists from the school district have begun to do testing with Roa for school coming this fall. I can't believe Rojo is heading to school! Roa is doing pretty well with the testing process itself. Momma has to sit on her hands not to help him. It is difficult to watch him struggle through the motor tasks. He tries with all his little might to put that puzzle piece in or reach the right block. Luckily his therapists know him well and give him as much credit in scoring as they can. Roa is imitating alot of sounds. That has been very exciting for us! He is consistently making an imitation when we give the visual cue of touching our lip. I am praying we will have a few basic needs terms mastered before school in the fall so that Roa's desires don't get lost in his screaming!! When King Roa doesn't get his way, we hear some yelling, to say the least. We are working on the communication piece at every chance! Roa is really tired of gait trainer time indoors. I'm gonna wring that little groundhog's neck if he is wrong and spring isn't just weeks away! It is time to head outdoors. Other brief updates- Roa is rolling down an incline mat at Courage with INDEPENDENCE! Yeah!! He is attempting arm and leg movements coordinating for crawling. We have started sitting on the pottychair to practice going potty. Wish us luck with that! Gotta run! Prince Gunnar beckons! 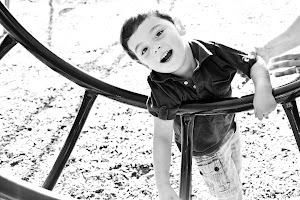 Final note~ March is Cerebral Palsy Awareness month! Pass on my blog or other CP links to friends and family to spread the facts and open up the eyes of others about disabilities. God made us all different, but gave some of us extra graces meant to help others. Reach out and help someone different from yourself today!